This year, 2019, promises to be our best year ever! It will be a year full of fun and exciting events and activities. This year, we will be moving our classes and activities to the Lions Club Building on Dave Creek Parkway. The target date for the big move will be March 11, 2019. New signage will be installed on the outside of the building indicating that it is our Activity Center as well as the Lions Club Building. You will start to see changes soon. We have already re-painted the inside of the building and soon we will also be making other improvements. This will give us the space we have needed for our classes and other activities. Our spring Souvenir Shop merchandisehas begun arriving and it is so exciting! You are going to like our new T-shirt styles! Colors are more vibrant this year and really “pop”. It seems almost every box we opened had a shirt we liked better than the last one. This year’s selections will be better than ever! Fairfield Lanes is on a ‘roll!’ Fairfield Lanes Bowling Center, Arcade & Café. We are doing something new at Fairfield Lanes. Our February Valentine Special will be $9.99 per person Unlimited Bowling every Friday night (Shoe rental not included)! Of course, you can still bowl fewer games as well. We continue to have a good selection of menu items in our Café’. Our chicken strips are just “the best”. Add tots and a drink to complete your meal. A complete menu is available for your dining pleasure. Don’t forget the kids arcade games and our pool tables. We have begun preparing for our annual Fun ‘N Sun Summer Bash, which is on May 25th. Complete details will be announced later. Save the date for a full day of fun that will begin with the Pickle Ball Bash followed by Lawn Games, a special lunch and an evening of music by one of our local bands. 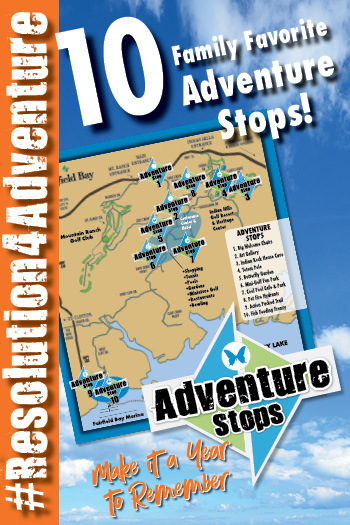 It is a full day of fun you are sure to enjoy!! Fourth of July weeklong celebration. You can look forward to the July 4thactivities here as well. Our annual parade will be Thursday, July 4th. Fairfield Bay Fireworks will be on Friday, July 5thfrom our marina area. Fairfield Bay Marina is planning a special day on Saturday, July 6thand will have a live band for your enjoyment. Make your reservations now and stay for the entire 4-day weekend! 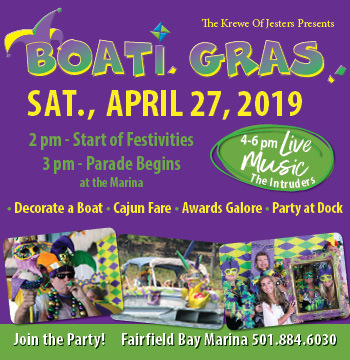 It will be a weekend you will enjoy these and other activities in Fairfield Bay Area. Endless Summer Bash, Saturday, August 31st. It will be a full day of fun with details to be announced later. This is only the beginning. 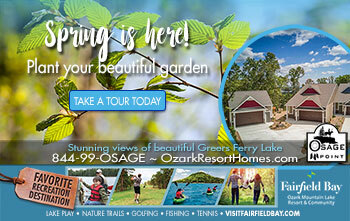 Fairfield Bay is the place to be this spring and summer. Mark your calendars now. Come early and come back often for the best in Family Fun!